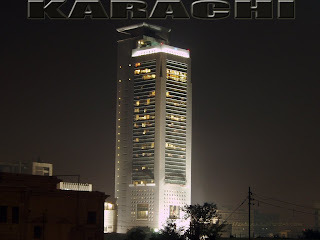 Karachi is the largest city of Pakistan which is famous as a city of lights (roshanion ka Gahr) Karachi.There are many places to visit in karachi Bahria icon, Karachi port, Mazar-e-Quaidkarachi beaches and many things to do for fun in the city. karachi is the largest city as population census, Main seaport and the financial capital of Pakistan, and the capital of the province of Sindh. With a city population of total 18.5 million.As compare in terms of population, 13th largest urban agglomeration (2006), the 4th largest metropolitan area in the world, and the 2nd largest city within the Organisation of the Islamic Conference. It is Pakistan's premier centre of banking, industry, and trade. Karachi is home to Pakistan's largest corporations, including those that are involved in textiles, shipping, automotive industry, entertainment, the arts, fashion, advertising, publishing, software development and medical research. The city is a major hub of higher education in South Asia and the wider Islamic world. Karachi is ranked as a Beta world city. Its prominent position partly because of its location on a bay, making it the financial capital of the country. It is one of the fastest growing cities in the world in past and todayIt was the First capital of Pakistan until the construction of Islamabad and is the location of the Port of Karachi and Port Bin Qasim, one of the region's largest and busiest ports. After the independence of Pakistan, the city's population increased dramatically when hundreds of thousands of Urdu speaker migrants or Muhajirs from India, East Pakistan (later Bangladesh) and other parts of South Asia came to settle in the city. Karachi city is spread over 3,530 km2 (1,360 sq mi) in the area, almost five times bigger than Singapore. It is locally known as the "City of Lights" (روشنین جو شهر) and "The bride of the cities" (عروس البلاد) for its liveliness, and the "City of the Quaid" (شهرِ قائد), having been the birth and burial place of Quaid-e-Azam (Muhammad Ali Jinnah), the founder of Pakistan, who made the city his home after Pakistan's independence. Mazar-e-Quaid (Urdu: مزار قائد) or the National Mausoleum refers to the tomb of the founder of Pakistan, Muhammad Ali Jinnah. 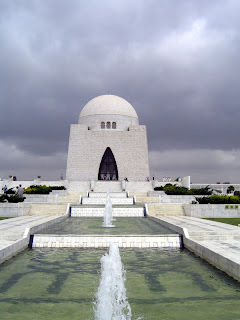 It is an iconic symbol of Karachi throughout the world. The mausoleum (Urdu/Persian/Arabic: mazār), completed in the 1960s, is situated at the heart of the city. MCB Bank Limited formerly known as Muslim Commercial Bank Limited was incorporated by the Adamjee Group on July 9, 1947, under the Indian Companies Act, VII of 1913 as a limited company. The bank was established with a view to providing banking facilities to the business community of South Asia. The bank was nationalized in 1974 during the government of Zulfiqar Ali Bhutto. This was the first bank to be privatized in 1991 and the bank was purchased by a consortium of Pakistani corporate groups led by Nishat Group. As of June 2008, the Nishat Group owns a majority stake in the bank. The president of the bank is Mr. Atif Bajwa (previously with Citi Bank). 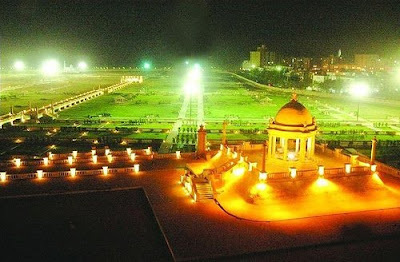 Bagh Ibne Qasim (Urdu: باغ ابنِ قاسم‎ ) is located in Clifton, Karachi, Sindh, Pakistan. Inaugurated by President Pervez Musharraf on February 27, 2007, Pakistan's biggest park constructed underClifton Beach Development Project on 130 acres (0.53 km2) of land. The old Toyland Theme Park has been done away with and this park replaces it. The park cost PKR 600 million and has been completed in 300 working days. More than 10 million people visited the park per year. Is also the largest family park in South Asia. Prior to the initiation of construction on Bagh-e-Ibne Qasim, 73 acres (300,000 m2) of land was freed from the grip of land grabbers. The entire Clifton beach, and the area now covered under the park. 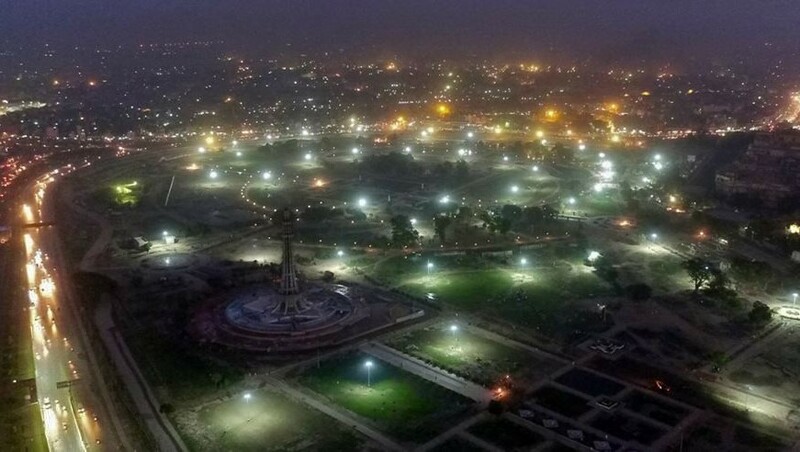 In June 2005, Sindh Governor Dr. Ishrat-ul-Ebad Khan took it upon himself to restore this major historical entertainment area to its original splendor. City Nazim Syed Mustafa Kamal also played a part in gifting the Jehangir Kothari Parade back to the people of Karachi. For entertainment purposes of visitors, the park has a turtle pond, in addition to which it also has 24 state-of-the-art washrooms. In order to create an element of originality, the park also has 20 stone canopies. Moreover, hundreds of thousands of unique rose saplings have been planted throughout the park. The park will also feature fast food outlets able to accommodate 500 persons at a time. This park has various murals of dinosaurs that are extremely huge and add to the excitement on the faces of the visitors that come from various parts of Pakistan. This park overlooks the 90-meter fountain kept and thus adds to the beauty of the Clifton area. 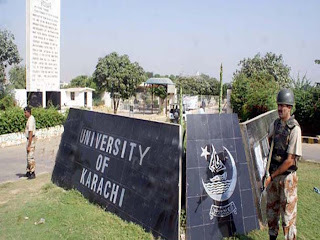 UNIVERSITY OF KARACHI The UoK (جامعہ كراچى ) is a public university located in Karachi, A well known University in Pakistan and Worldwide. It serves an on-campus student population of more than 24,000. According to the Higher Education Commission (HEC) of Pakistan, it is ranked among the top universities of the country. The university has made itself known by producing the largest amount of research output in terms of the patent, the international peer-reviewed, journals and organizing regular academic conferences. In 2008 the university entered the THE-QS World University Rankings for the top 500 universities in the world. 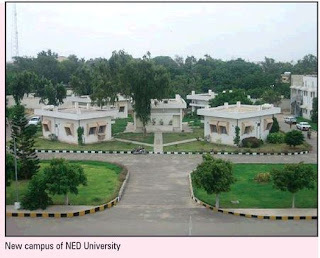 NED UNIVERSITY OF ENGINEERING The NED University of Engineering & Technology is the oldest degree-level engineering institution in Pakistan. According to the Higher Education Commission of Pakistan, NED is one of the top-ranked engineering universities in Pakistan. With its current enrollment of more than 6000 students, NED University offers bachelor’s degree programs in nineteen departments of engineering disciplines, as well as, master’s degrees in some disciplines. Additionally, there are programs for doctoral development of faculty. The University also offers bachelor’s degree programs in Architecture (B-ARCH) and in Computer Science / Information Technology (BCIT). The NED University has its own Internet facility (LAN) over end-to-end Fibre Optic Network available to all the departments. Among public-sector institutions, the NEDUET is unique in that it has a computerized Library Management System interlinked with Optical Fibre Network which makes the library resources available to all the departments while also providing them easy access to libraries/institutions all over the world. One of the great achievement of NEDUET is the establishment of High-Performance Computing Centre where a quality environment has been provided to the research scholars from diverse engineering field to pursue their research. The center has been housed with 50 nodes Cluster providing high-performance computing facility to its registered users. The center is a centralized location for all the departments in NED UET. It also housed with numerous number of engineering software used by researchers, postgrads and final year undergrads of the university. The center has now started its own training center where different pieces of training related to software and latest technologies are provided to students, faculty, and researcher. NEDUET is also ISO9000 certified. Empress Market is located in Saddar Town of Karachi, Sindh, Pakistan. Empress Market was built in 1889 and was named in honor of Queen Victoria, Empress of British Empire in South Asia. 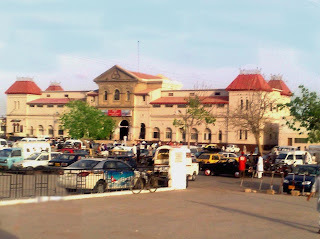 Empress Market is the central shopping center of Karachi. 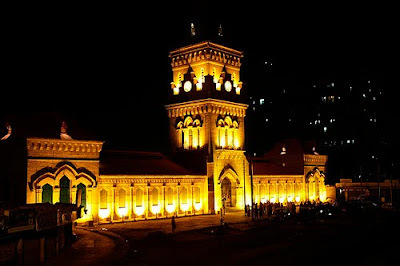 The Empress Market was constructed between 1884 and 1889 and was named to commemorate Queen Victoria, Empress of India. It was designed by James Strachan, the foundations were completed by the English firm of A.J. Attfield, and the building constructed by the local firm of ‘Mahoomed Niwan and Dulloo Khejoo’. The building was arranged around a courtyard, 130 by 100 feet (40 by 30 m), with four galleries each 46 ft wide (14 m). The galleries provided accommodation for 280 shops and stall keepers; at the time of its constructio,n it was one of seven markets in Karachi. PAKISTAN LARGEST AIRPORT QUAID-E-AZAM INTERNATIONAL AIRPORT Jinnah International Airport (IATA: KHI, ICAO: OPKC) (previously Quaid-e-Azam International Airport قاۂد اعظم بین الاقوامی ہواگاہ) is Pakistan's largest international and domestic airport. It is located in Karachi, Sindh, and its passenger terminal is also commonly known as the جناح ٹرمینل Jinnah Terminal. 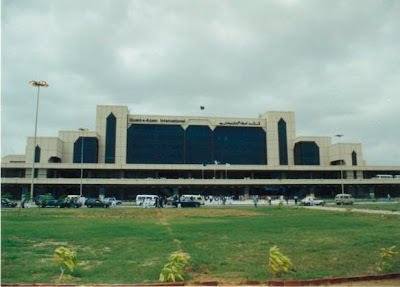 The airport is named after Crown attorney/statesman Muhammad Ali Jinnah, the founder of Pakistan and its first Governor-General, who was popularly known as the Quaid-e-Azam ("Great Leader").The airport provides a primary hub for the flag carrier, Pakistan International Airlines (PIA), Shaheen Air International, and Airblue as well as many other private airlines. The airport is equipped with aircraft engineering and overhauling facilities including the Ispahani Hangar for wide-body aircraft. The Port of Karachi (Urdu: بندر گاہ كراچى) is Pakistan's largest and busiest seaport, handling about 60% of the nation's cargo (25 million tons per annum).The port is located between the towns of Kiamari and Saddar, close to the heart of old Karachi, the main business district, and several industrial areas. The geographic position of Karachiplaces the port in close proximity to major shipping routes such as the Strait of Hormuz. 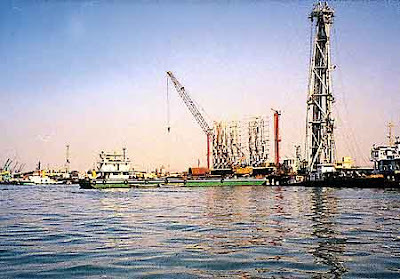 The administration of the port is carried out by the Karachi Port Trust which was established in the nineteenth century.